Russian servicemen are digging ditches and trenches at the Chonhar and Kalanchak checkpoints. 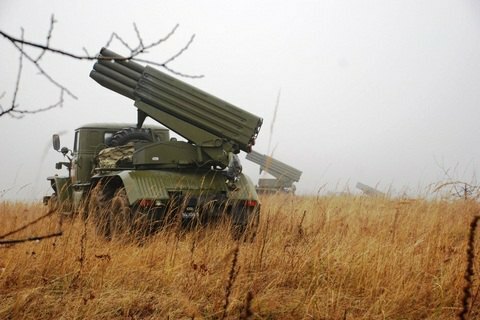 A Grad multiple rocket launcher has been seen at the Russian side of the Chonhar checkpoint on Ukraine's administrative border with occupied Crimea, General Staff spokesman Vladislav Seleznyov has said in the air of 112 Ukrayina TV. "Five KaMAZ lorries arrived and recently one BM-21 Grad arrived in the area of Armyansk," he said. He said that as of 2.15 p.m. Kyiv time, a mechanised company of the Russian armed forces arrived on cars in the area of Dzhankoy. They unpacked in battle formation and are now busy with engineering works literally 2 km from the Chonhar checkpoint. The same is happening in the area of Armyansk. In his words, engineering works by Russian servicemen is underway in the area of the Kalanchak checkpoint, 500 to 1,000 , from the administrative border between Kherson Region and occupied Crimea. They are digging ditches and trenches. There are up to 100 servicemen in each area. "We are observing this situation and are prepared for any development of events," Seleznyov said.